Movie tracing chronostratigraphic chart exercise created by Jerry Baum. Horizontal axis represents geographic position of pseudo-shot points (S.P.) and the vertical axis tracks the succession of contemporaneous sediment layers of geological cross section or layers of seismic reflectors used in exercise; layer one is at the base and is the first layer to accumulate and layer thirty forms the topmost horizon. These layers are known as "chronosomes" and are represented as horizontal layers bounded by time planes. The patterns of the chronosomes Wheeler (1958, 1964) show the coastal trajectory of sediment layers or their equivalent seismic reflectors. Click image to see movie! Analysis of the sedimentary fill of a sedimentary basin is aided by building both a sequence stratigraphic framework of the basin, accompanied by chronostratigraphic correlation chart. There follows a better understanding of the physical processes involved with the depositional facies and the origin of the accommodation. The use chronostratigraphic charts or Wheeler diagrams, represent a powerful tool for the study unconformity bounded sequences, the understanding the stacking patterns of sedimentary and accommodation successions (Neal and Abreu, 2009) that fill a basin margin and their relationship to sea level. The resulting relative sea level chart can be compared to global and coastal onlap charts to better interpret patterns of sedimentation; in particular the role of eustasy versus tectonics in controlling the accommodation. Unconformity bounded megasequences and their component high frequency sequences can better examined. Component aggradational, progradational stratal patterns, retrogradational to degradational successions can be identified on the seismic and Wheeler diagram sections. Using GR well logs can be tied into this analysis with global onlap chart may seperate tectonics from eustasy and emphasize eustasy as a potentially prominent factor in generating and consuming accommodation space and accounting for sedimentation patterns that include coastal trajectory. 1• Exercise 1 - Objective: Learn how to construct a chronostratigraphic chart and analyze the order and geometric organization of the sedimentary fill of a basin and establish why different sedimentary facies accumulated in different settings in response to the contemporaneous creation of accommodation. To construct a chronostratigraphic chart or Wheeler diagram (named after the geologist who initially formalized this time-stratigraphy concept in 1958) first identify and map the geographic location and order in which sedimentary units, bounded by discontinuities, accumulated in stratigraphic cross-sections. Display these units in the order they were laid down and their location on the chart. The units are known as "chronosomes" and are represented as horizontal layers bounded by time planes (See figure above). The horizontal axis of the chart match the horizontal dimension of a seismic, geologic, or well cross section and vertical axis represents time (click on the above figure at the top of the page to see the movie). Using the Wheeler diagram it is possible to infer how fast sediment accumulated before an unconformity developed or much sediment was eroded over an unconformity and where source rocks and reservoirs are likely to accumulate. The data source for a chronostratigraphic chart may be outcrops, well and/or seismic cross sections. The exercise teaches how to retrieve and display the location and order of the contemporaneous component layers accumulated in the stratigraphic section, and within in the enveloping systems tracts and sequences as a function of time and geography, and their relationship to surfaces of non-deposition (Emery et. al, 1996). The generation of a chronostratigraphic chart is based on an identical exercise created by Jerry Baum. It is also the subject of a web site movie linked to the image above that follows a changing geological cross-section tracking evolving contemporaneous sedimentary geometries responding to sea level change. The intent of the techniques learned in this exercise is that they be used to conduct chronostratigraphic analysis of seismic and/or geologic cross-sections and build a chronostratigraphic chart. The following section describes how to construct a chronostratigraphic chart. First download the exercise pdf file of a pseudo-seismic section by clicking on the image thumbnail below to be printed or importing into electronic media. This media might include a PC, Notebook, Tablet, or Pad. Now open Power Point in the electronic media and access the curve drawing tool. Using this tool draw the chronosomes on the exercise cross-section in the order these unirs accumulated and produce a chronostratigraphic chart. 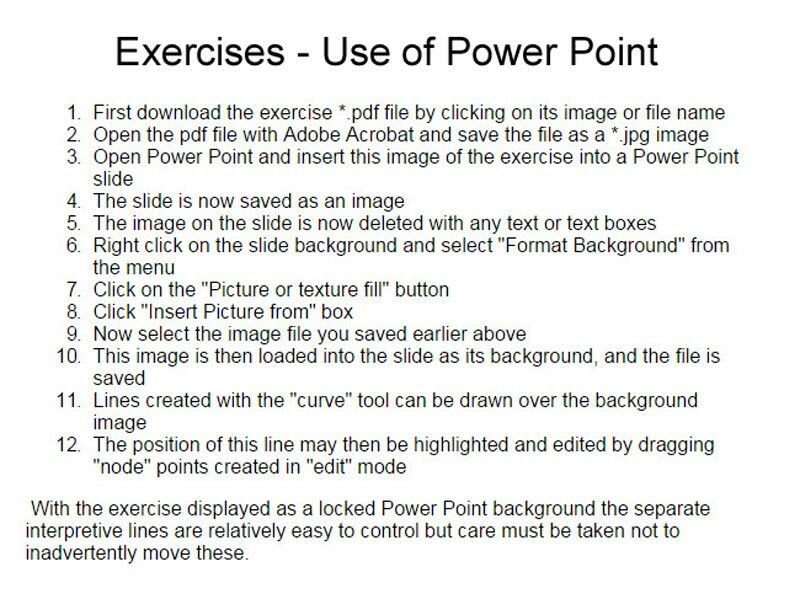 On completion of the exercise the Power Point output provides for the collective viewing of results in class. Click on red box for more details. 1. Carefully interpret the pseudo-seismic section by identifying and marking where reflector terminations intersect seismic surfaces. Identify the type of reflector terminations (onlap, downlap, toplap, and/or truncation). Reflectors are interpreted to bound contemperanous sediment bodies. 2.On the chart first identify and number the interpreted seismic reflectors in order of deposition, starting from oldest (numbered 1) to youngest (top reflector) as in the linked movie at the top of the page. a. The horizontal line matches the length of the pseudo seismic section or distance, with SP referring to "Shot Points" numbered 10 through 240. The vertical axis on the lower part of the diagram represents an arbitrary time line. The numbered time intervals, 1 through 30, are assumed to be of equal duration and bound contemporaneous sedimentary bodies, or chronosomes. b. Transfer the horizontal dimension of the interpreted reflectors, starting with oldest (numbered here as 1), to the bottom of the time chart. Draw this to match the horizontal length of the equivalent reflector. c.The introductory chapters described systems tracts and their bounding surfaces (sequence boundaries (S.B. ), the first transgressive surface, ravinement surfaces, condensed sections, and maximum flooding surfaces). Mark up these properties as related to that reflector (type, geometry, facies, systems tract info, SB type, etc., within the chronosome). Continue this process in order of deposition for all remaining reflectors on the seismic cross section. 4. The void space on the chart now represents areas of non-deposition, erosion, or condensation of the sedimentary section with thicknesses below the resolution of the seismic. 5. Read Miall (2004), and Wheeler (1958 and 1964) to gain further incite into the application of this chart and the significance of time in sequence stratigraphy. Chronostratigraphic exercise cross-section illustrated above but here in 3D perspective with detail of clastic response to varying sea level. Emery, D., Myers, K. J., 1996, Sequence stratigraphy, published by Blackwell Science Ltd., p. 297. Mitchum Jr., R.M., 1977, Seismic stratigraphy and global changes of sea level. Part 11: glossary of terms used in seismic stratigraphy. In: Payton, C.E. (Ed. ), Seismic stratigraphy––Applications to Hydrocarbon Exploration, vol. 26. A.A.P.G. Memoir, pp. 205–212.